Kevin Ryan smiles as you politely question his sanity. No point in beating around the bush, you've just mentioned last summer's, 'Slaughter on the Shannon'. All-Ireland Hurling Championship qualifier. 30 June, 2012. Limerick 8-26, Antrim 1-15. The Gaelic Grounds humiliation came after a summer of unravelling chaos in the Antrim hurling squad. Manager Jerry Wallace doing his own version of Lanigan's Ball after the Leinster Championship defeat by Westmeath as he stepped out, then in again, only to be finally ushered away in the week before the Limerick laceration. So you feel entitled to ask Kevin Ryan,"Why?". But the answer is calm and assured. "Everyone involved both inside and outside would realise that wasn't the real situation with Antrim hurling," says the Waterford man. "That was the result but I don't think even Limerick would believe there is that much between the sides. "Granted there is a fair way between them but I think that day was just a bit of freak." Warming to his theme, Ryan goes on to insist that the Antrim job was a position that had always held a degree of attraction for him. "It was a job I wanted. I spoke to one (Antrim county board) officer. I had no question beforehand. "Last year never came into my head. I knew that result (against Limerick) was not the real Antrim and that they had had some very good results in the last year or two. "One of the main attractions for me is the way that despite being so far removed from the hurling centre, if you like, that there is still that intensity and passion for the game. "Club hurling has also always been strong up here and Antrim hurling per se as a hurling county was very attractive to me." Being installed in the job in late September didn't give the Mount Sion club-man a great deal of time to survey the club scene in the county but he has been able to address that over the last number of weeks. Perhaps even more than other counties, inter-club rivalry has affected Antrim teams in the past and Ryan knew full well that fostering good relations with the clubs would be important. "I would like to see more forums with clubs and I intend to do a lot of that myself. "It's important that we listen to the clubs' problems and let them see some of the things we're trying to do. "(Clubs have) That fear that the county just wants to squeeze the club players and bring the best out of them and then just throw then back on the heap. "A lot of stuff like that is important and that's going to take up an awful lot of time." Ryan will hope that those contacts with the clubs may also help him spread his ideas about the crucial importance of under-age structures. "I would have underage teams, under-14s, under-16s and particularly minors and under-21s, preparing in the same type of style and methods of senior teams. "And I don't mean that as my methods but as an agreed structure. "Having underage panels working in that way would support the senior team and people would have a vision for maybe 10 years rather than just a year. "Also, for players to develop at under-14, under-16 and minors, it needs to be a lifestyle. "It was different years ago when a lad at 16 or 17 could be playing all types of sports and choose between them at the age of 19 or 20. "I think a lad has got to have his priority (in terms of which sport) when he's 15 or 16 at the latest and start development from there." But in terms of the now, Ryan professes himself content with his first number of months in charge. 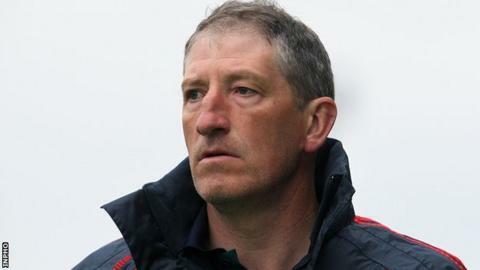 The ex-Carlow manager formulated the bulk of his panel in the autumn but Loughgiel trio Eddie and Tony McCloskey and Shay Casey have joined up following their All-Ireland Club Championship campaign and panel additions over the coming weeks could include a couple of the Shamrocks youngster brigade. "We've made some changes in the last six or seven weeks with certain players coming to light. "Even this week, there were one or two lads asked into the panel who hadn't been asked before. "We would be confident of what we have right now. And even with the four lads that we are looking at bringing in, they are under-23." Ryan's latter comment suggests that the door now appears closed on mercurial Loughgiel man Liam Watson after he publicly stepped away from the squad in November. For his part, the Saffron manager is calling for patience from Antrim supporters and support for his young squad. "I'm looking at long term and medium term rather than short term. "That might not be quick enough for some people but I know that lads themselves and the backroom team are content enough with how things are going. "I'm quite impressed where they have come in the last three months in terms of the pace of some of their hurling. "I've made this point before but I'm sick of hearing about Second or Third Division players aren't this or that. "I keep making the point that Kilkenny won an All-Ireland with 14 junior hurlers over their campaigns. "Would you tell Brian Cody that you can't play junior hurlers? You wouldn't have had young (Walter) Walsh in last year's All-Ireland Final replay and nearly being man of the match. "We have young lads there. They are good enough and they are working hard." Former 400 metres world indoor bronze medallist Paul McKee is helping to put the Antrim squad through their paces in his role as squad fitness trainer. "He brings the type of athleticism I'm looking for in hurlers," adds Ryan. "My belief is that you need enough strength and conditioning so that you can hurl, move, twist and turn and take a few hits and give a few hits. "A footballer needs to be conditioned differently with a lot more muscle and poundage. I think some of that inhibits hurling. "Paul comes from a 400m sprint background and is very much into the type of physical training that I would promote." Ryan and McKee will join the rest of the squad on the team bus down to Limerick on Saturday ahead of Sunday's Division 1B opener. It's back to the scene of the crime if you like but one senses that Ryan will take a measured response to what even transpires in the Gaelic Grounds. "I'd like to see them (the team) given a chance. But a chance for me is 18 months from now. Not two months."